'Social Welfare' Organizations Play Big Role In Presidential Politics : It's All Politics Some of the heaviest advertisers are groups financed by anonymous donors. They're not organized as political committees, but as "social welfare" organizations. One of those groups, led by GOP strategist Karl Rove, is rivaling the campaigns themselves for ad money spent so far in the election. Karl Rove attends a ceremony to unveil the portrait of former President George W. Bush at the White House in May. 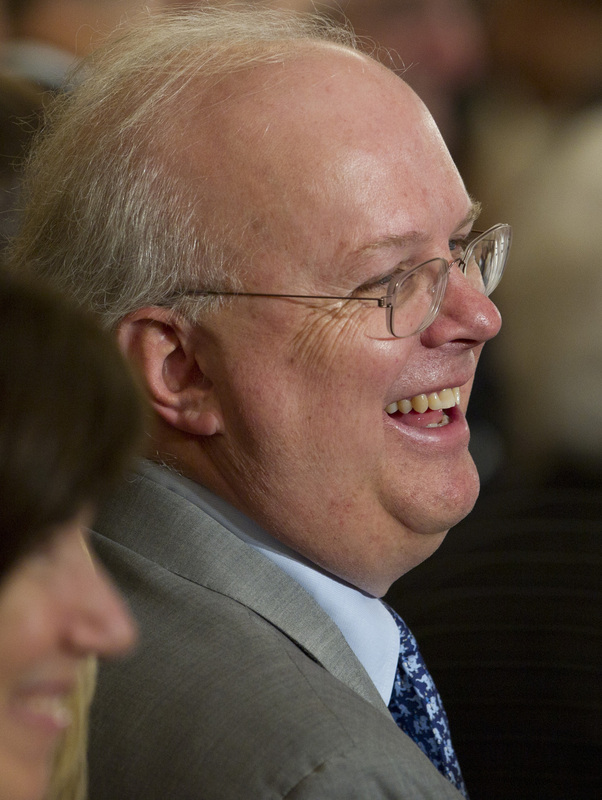 A former Bush adviser, Rove also is a founder of Crossroads GPS. Some of the heaviest advertisers in the 2012 presidential campaign are groups financed by anonymous donors. They're not organized as political committees, but as "social welfare" organizations. Peter Overby, NPR's money and politics correspondent, says one of those groups is rivaling the campaigns themselves for money spent on high-profile ads so far in the campaign. Four months before the election, the top three advertisers are President Obama's re-election campaign ($40 million), Mitt Romney's campaign ($32 million), and — at $29 million — Crossroads GPS, which is classified as a "social welfare" organization for federal tax purposes, Overby tells NPR's Weekend Edition Saturday. And such social welfare organizations are looming large, Overby reports. One such group, Americans for Prosperity, which is backed by wealthy conservative donors, rolled out a $9 million ad campaign in swing states attacking Obama and the health care law right after the June 28 Supreme Court ruling. Officially, social welfare organizations are classified under Section 501(c)(4) of the tax code, which means they perform some kind of public or community benefit, Overby explains. They include groups like local volunteer fire departments, Rotary International and the League of Women Voters. "There's this gray area where election law meets tax law," Overby explains. "While the campaigns are disclosing their donors, the superPACs are disclosing their donors, the (c)(4)s do not have to disclose their donors." Crossroads GPS ran this ad in Virginia, criticizing the policies of President Obama and Democratic Senate candidate Tim Kaine. Republican strategist Karl Rove, a leader of Crossroads GPS, told Fox News recently why the group can call itself a "social welfare" organization: "It's a social welfare organization because it spends the vast preponderance of its money in furtherance of its social welfare goals. It's an issues advocacy group. For example, it's talking right now about the need to change our policies on spending and debt." Crossroads GPS, which was formed in 2010, shortly after the Supreme Court's Citizens United ruling that loosened some campaign finance regulations, has raised $77 million in its first two years in existence. Overby reports that 90 percent of that came from — at most — 24 donors. "This is what makes the social welfare organization approach so appealing," Overby explains. "You've got a couple dozen people who are able to play this incredibly powerful role in the election. It's anonymous. Nobody will ever know who they are. Not their business competitors. Not their political rivals. And not the voters."